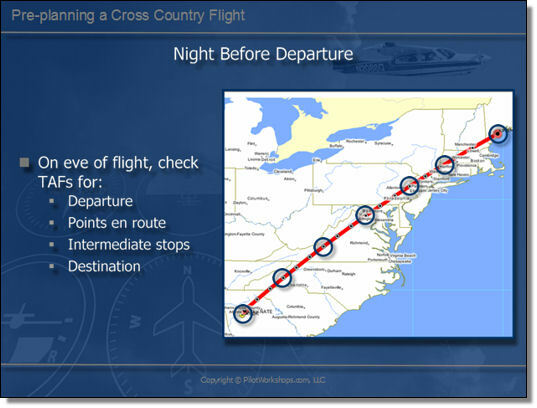 "In a previous module, Bob Nardiello discussed how to prepare for a flight, and focused on the period 36 to 48 hours in advance of your departure. In this module, he reviews things you can do 24 hours before the flight to give yourself the best alternatives for a successful outcome. Let’s assume it’s now the night before your intended departure. What process are you following at this point?" "On the eve of the flight we would be looking at the TAF, the Terminal Area Forecast, for our departure point, for points en route, for intermediate stops and for our destination. And the items we would be looking for particularly are low ceilings, fog, thunderstorms, items which would affect us flying light aircraft. 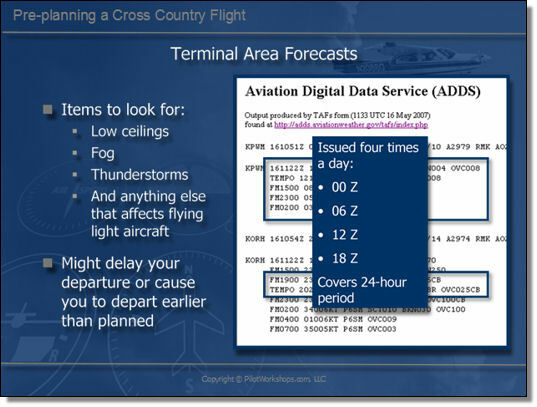 As a for instance, if the departure airport Terminal Area Forecast, if that TAF were indicating fog in the morning, that might delay our departure because certainly we don't want to depart without an ability to return to our departure airport if we have some sort of problem. 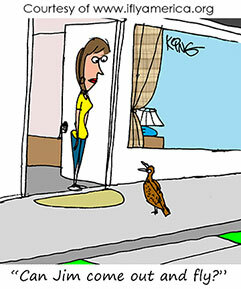 So we would definitely not want to depart if unable to get back in, if unable to return. Likewise our fuel stops would be affected and certainly our destination airport - if it were below minimums - would cause us to change our departure time. On the other hand, for instance, thunderstorms in the afternoon as we frequently experience in the summer in the Northeast, might affect our departure time. It might in fact, cause us to depart earlier to avoid these. A Terminal Area Forecast, which is issued four times a day - at 00 Zulu, 06 Zulu, 12 Zulu and 18 Zulu - runs for 24 hours and gives us a pretty good idea of what we're looking at in the short term."